In a superhero cape, he feeds the city’s hungry and homeless. 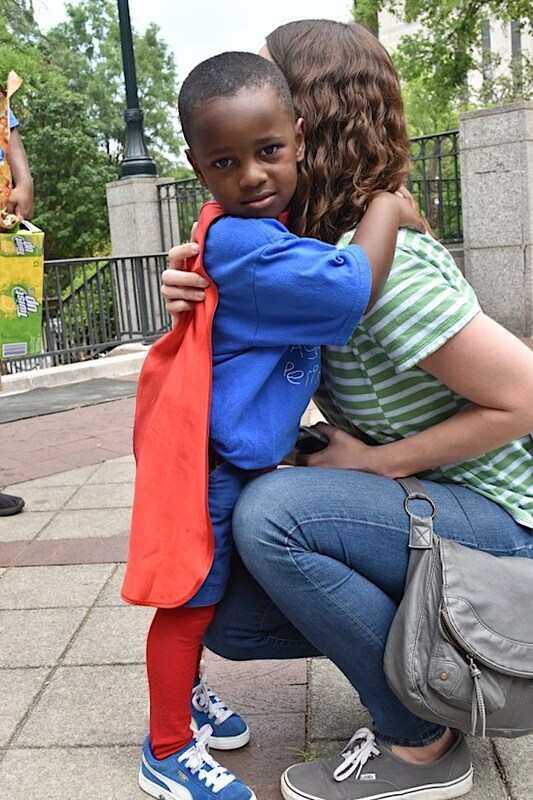 And he’s only 4 | CNN Austin Perine's superhero cape glides and flutters as he hands chicken sandwiches to homeless men outside a shelter in Birmingham, Alabama. Birmingham (CNN) Austin Perine’s superhero cape glides and flutters as he hands chicken sandwiches to homeless men outside a shelter in Birmingham, Alabama. It’s a sweltering 95 degrees outside, but at age four, Austin is undeterred. The red satin cape he wears, he says, makes him go faster. “It blows in the wind,” he explains with a smile. At the shelter, he’s quickly met with a merriment of high-fives and pats on the shoulder. Since March, he’s become a familiar face to the homeless men and women congregated on the sidewalk outside the Firehouse Ministries’ red brick building. Austin Perine, hands out meals outside the Firehouse Ministries shelter. “I am,” responds Austin, handing him a paper-wrapped sandwich and a cold drink. He’s wearing his “work outfit” — all blue — sneakers, shorts and a t-shirt, glitzed up by bright red tights and a cape. The catchphrase “#ShowLove” is emblazoned in bold red letters across his chest.